Can’t Make It Green? Tear It Down! That’s the plan in the U.K. as aging buildings face the wrecking ball. 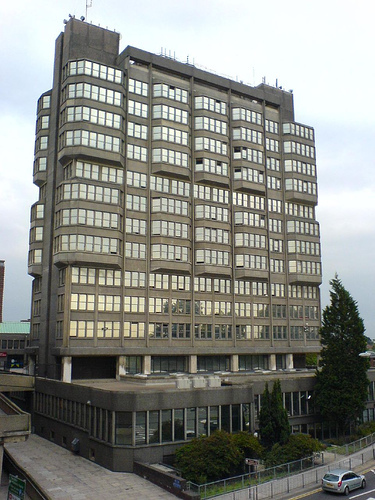 Aylesbury’s County Hall may face demolition. 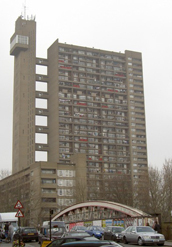 Britain’s brutalist boom in the ’60s gave the country some of its most distinctive architecture, for better or worse. The beauty of those hulking, gray concrete towers is debatable, but one thing’s for sure: they ain’t exactly green, and most are so cheaply built that retrofitting them with eco-friendly updates isn’t worth it. In the ’60s, everything was built cheaper, faster, and nastier. If you are going to try to fix buildings, then really you won’t have too many problems with anything built earlier than the ’50s or after the ’80s. The country is pushing hard to cut its carbon emissions to 80% of 1990s levels by 2050. Part of that strategy has all buildings built from 2018 on carbon-neutral. But what to do with the old ones? If the country follows through on Morrell’s plan, entire city centers could be at stake: Newcastle, Slough, Aylesbury, and scores of other towns all boomed in the ’60s and ’70s, and it shows. It’s bad news for the rare breed of architecture buffs that digs these buildings–U.K. icons like the Tricorn Center in Portsmouth or the Trinity Car Park in Gateshead (the unsung star of Get Carter) have already been demolished. Of course, the cream of the concrete crop–those buildings listed as historic by English Heritage–are immune from aesthetically compromising retro-fits like new windows and their emissions aren’t counted towards the country’s carbon footprint. Ultimately, it’ll come down to the numbers on a building-by-building basis: is it cheaper to refurbish or start from scratch? It’s easier to build green if you build new (disregarding the environmental impact of demolition and new construction, of course), but one has to wonder if this is really an aesthetic argument disguised as an environmental one–and if that’s really a bad thing.